Of all the things precious to us - Friendship, Love, Time and Wisdom should figure ahead of Wealth. But there's one thing that's more precious than any of these, and that is Truth. Truth is pristine and self-evident just like Al Haramain's latest offering that's pure and forthcoming. 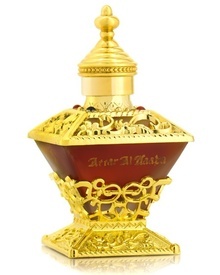 A fragrance so rich and dignified, we couldn't think of calling it anything else but Al Haramain Gold.